Horribly distorted body shapes for all! You read correctly, stranger. 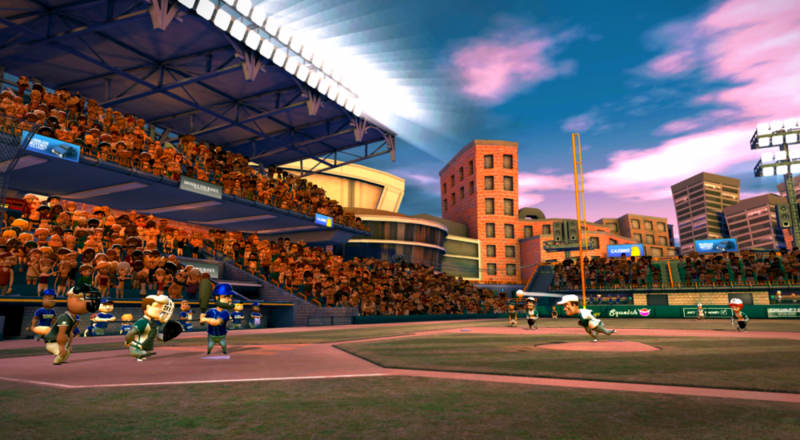 The wild, uncivilized frontier of arcade baseball software is expanding its territory to the Xbox One and PC in the summer of 2015. Super Mega Baseball, a game unique to the modern sports genre in both presentation and mechanics, can soon be experienced by nearly all gamers, regardless of their allegiances. Given the subtitle Extra Innings, the forthcoming port promises to bring a slew of extra content ranging from brand new stadiums to enhanced gameplay and simulations. To be perfectly honest, I'll take any excuse I can get to dive back into the game's 2 player local co-op mode and lead the Overdogs to glory once more. Currently, though, there is no word as to how the Playstation 3 and 4 versions of the game will be affected. Barring a patch or DLC option, current owners may need to look elsewhere to experience the newly introduced content. I was quite into Super Mega Baseball. Some might find the art style jarring (we loved it, but that may be because we're horrible people), but it's hard to argue against the game's mixture of easy-to-learn/difficult-to-master mechanics. Plus, who would turn down the opportunity to crack open a cold beverage with a friend and enjoy a nice, relaxing game of Murder the Sphere? SMB's success is fantastic news for the arcade sports genre. With any luck, we'll be seeing more entries from the team at Metalhead or elsewhere in the future. Page created in 0.7157 seconds.